PRODUCT DESCRIPTION: Broadleaf herbicide which has been around a long time and is commonly used in agriculture. 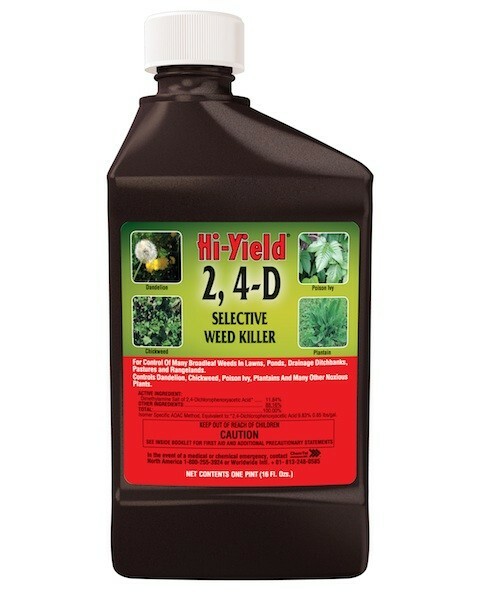 The 2-4 D is still used quite a bit and though it won't handle every weed, it can be quite useful for keeping most wild and unwanted plant growth minimized in grass, pine straw, mulch and other areas. WHERE TO USE IT: 2-4 D has long been used on the farm but has both lawn and turf applications. In other words, it is commonly used over grass in the yard to keep weeds at bay. RATE OF APPLICATION: 8 – 32 oz per acre which translates to about .75 oz per gallon of water per 1000 sq/ft of turf.